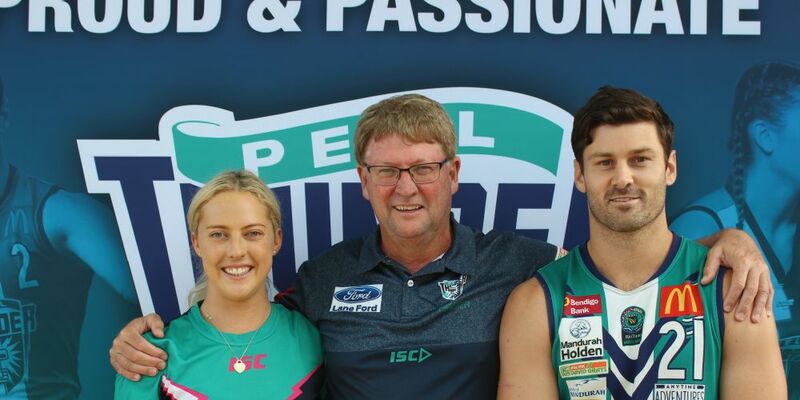 Peel Thunder player Georgia Perry, men's league coach Cam Shepherd and community development officer Ben Howlett. ROUND one of the WA Football League starts on Saturday and Peel Thunder will be hoping to bounce back to premiership-winning form. Peel Thunder were perennial cellar dwellers for the first 18 years of its WAFL existence, but the club enjoyed two stellar seasons in 2016 and 2017, winning back-to-back premierships. Peel finished seventh on the ladder in the 2018 season. It was a setback to their winning streak that Peel hopes to overcome. “We have a lot of personnel changes as well as some major changes to our game plan,” coach Cam Shepherd said. “We have recruited in Jackson Merrett and have had some 15 players come in whilst losing about 20 players to other leagues. Shepherd said some of the young players who showed a lot of promise included Jordan Boullineau, Jarvis Pina, Ryan Bennell and James Sturrock. He said he was excited to see how these young players progressed. Shepherd said the new West Coast Eagles team were a new aspect this season. “They are now just another competitor to challenge for the top five,” he said. Peel Thunder will take on West Perth at 2.15pm this Saturday at David Grays Arena. “We are looking forward to the first game against West Perth,” Shepherd said. “They are a very good side.